This week I decided to see just how much food I could get for $20 at Trader Joe’s. Since this grocery chain is nationwide, there’s a pretty good chance you have one near you. Below, I list what I bought (obviously) but also how I think it could be used in different meals, assuming you have some oil and a few spices or sauces in the house. Whether enjoyed by the glass or added to a dish for creaminess, almond milk is a must-have staple in any vegan pantry. I’ll definitely use this on the hot cereal and probably have a glass with a little bit of dark chocolate. First off, this will last you far longer than a week. This cereal is made with rye, barley, oats, and wheat, which made me feel like I was getting more than just oatmeal. Add some almond milk and peanut butter or sliced banana (or both!) and you’ve got a healthy, satisfying breakfast. This peanut butter is super affordable and a great way to pack some plant-based protein into your diet. Try freezing one of your bananas and blending it with peanut butter and almond milk for a dreamy dessert. Another cheap source of protein, these fiber-rich black beans would be great in tacos, atop a hearty salad, or as part of a tempeh and sweet potato chili. Or if you’re feeling especially ambitious, you could attempt an easy black bean brownie recipe with the chocolate below! P.S. Garbanzo beans are the same price! Use this marinara to create a hearty pasta dish by loading it up with diced carrot and onion. Add some tempeh or black beans to bulk it up even more. Or use a little bit as the base for chili! 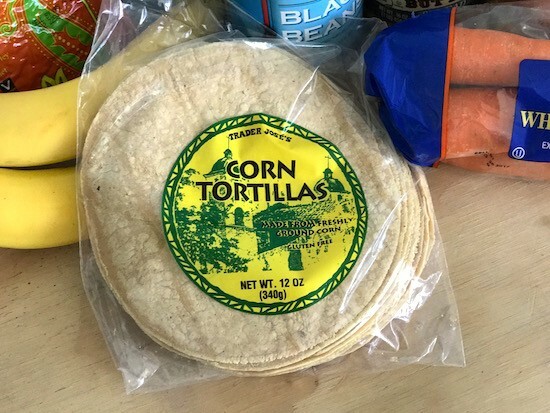 Corn tortillas were cheaper than pretty much all their bread options, and they also provide a lot of different choices. Make tacos, quesadillas, or enchiladas (TJ’s sells a dope enchilada sauce if you want to splurge). Trader Joe’s offers a few varieties of pasta for only 99 cents, including rigatoni, penne, and farfalle. Top with marinara or serve cold with a creamy peanut sauce, shredded carrot, and cruciferous veggie blend. 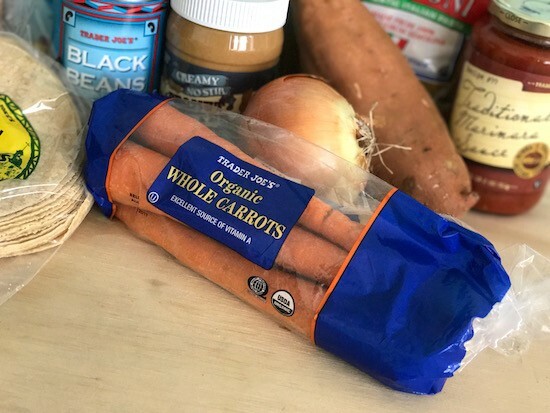 Trader Joe’s isn’t necessarily known for having the most affordable produce, but I think one of the veggies that provides endless meal opportunities is sweet potato. Steam, mash, or bake for breakfast, lunch, or dinner! Onion is an important ingredient in a lot of recipes and an easy way to add flavor to a dish. As mentioned above, you can dice it and add to your marinara sauce, or you can caramelize it and serve atop sweet potato and black bean tacos. Most of the greens at Trader Joe’s are the same price, but I usually opt for their Cruciferous Crunch Collection because it is great both cooked and raw and tends to spoil less quickly than other greens like spinach. I chose carrots because I like them raw and roasted, giving me a couple of meal options. Try them chopped in your marinara sauce, shredded in a salad with apple, or roasted with sweet potato and onion. You will not find tempeh at a more reasonable price than at Trader Joe’s. Honestly, it’s half the reason I shop there. Make a savory breakfast scramble or taco filling and top with the cruciferous veggies or diced, baked sweet potato. You can also cube and roast it for a protein-rich “crouton” for a salad. Trader Joe’s sells bananas at a great price, and they are perfect for making peanut butter and banana quesadillas. Plus, you can use bananas as an egg replacer in baked goods! Although they charged me $1.29 (according to the receipt), this was a 79-cent apple. Eat it as a snack with some peanut butter or chop it up and add it to your hot morning cereal. This was my splurge item. You can choose your own adventure and pick up some masala burgers or sunflower seeds for the same price! Whether you’re on a strict budget or just trying to save a little more each month, sticking to a grocery list can be super helpful, since you will need to put more thought into how to get the most for your money. I hope this will inspire you to get creative with different combinations of food, rather than buying with just one or two meals in mind. Looking for more info on stocking your vegan pantry? Here ya go!